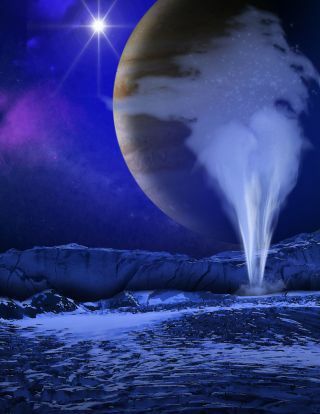 Artist's concept of a water vapor geyser erupting from the surface of Jupiter's icy moon Europa. NASA's Hubble Space Telescope spotted evidence of such plumes on Europa in December 2012, but they haven't turned up in other observations. SAN FRANCISCO — The huge geysers on Jupiter's icy moon Europa have gone underground. Late last year, scientists announced that NASA's Hubble Space Telescope had detected plumes of water vapor spewing about 120 miles (200 kilometers) into space from Europa's south pole in December 2012. The news was met with a great deal of excitement, as it suggested that a robotic probe may be able to sample Europa's possibly life-supporting subsurface ocean without touching down. "We have not yet found any signals of waper vapor in the new images so far," team member Lorenz Roth, of the Southwest Research Institute in San Antonio, said Dec. 19 during a talk here at the annual fall meeting of the American Geophysical Union (AGU). Image showing the location of water-vapor plumes on Jupiter's icy moon Europa as seen by NASA's Hubble Space Telescope in December 2012. Other Hubble search campaigns since then have not seen any signs of the plumes. Other research teams have also failed to confirm the plumes. For example, a recent re-analysis of images gathered by NASA's Galileo probe, which studied the Jupiter system up close from 1995 through 2003, turned up no evidence of their existence, said Cynthia Phillips of the SETI (Search for Extraterrestrial Intelligence) Institute in Mountain View, California. "I find it hard to believe that if a plume that was similar to the plumes we see on Enceladus had been going off on Europa during the Galileo era — I find it really unlikely that we would have missed it," Phillips said during her talk at AGU on Dec. 19. "I think we would have seen that thing." Further, researchers announced on Dec. 18 at AGU that NASA's Cassini spacecraft, which flew by Jupiter in 2001 on its way to Saturn, also didn't see any plume activity at Europa at the time. "We found no evidence for water near Europa, even though we have readily detected it as it erupts in the plumes of Enceladus," Larry Esposito of the University of Colorado at Boulder, team lead for Cassini's ultraviolet imaging spectrograph insturment (UVIS), said in a NASA statement. UVIS measurements also suggest that most of the hot gas surrounding the satellite originates from the neighboring volcanic moon Io, not Europa, and that Europa's wispy atmosphere is 100 times less dense than thought, the study found. However, none of this necessarily means that Europa's geysers don't exist. "It is certainly still possible that plume activity occurs, but that it is infrequent or the plumes are smaller than we see at Enceladus," Cassini UVIS team member and study co-author Amanda Hendrix, of the Planetary Science Institute in Tucson, Arizona, said in the NASA statement. "If eruptive activity was occurring at the time of Cassini's flyby, it was at a level too low to be detectable by UVIS." Indeed, the plume's discoverers had no expectation of constant and intense activity; Hubble observations in October 1999 and November 2012 did not detect any geysers, Roth said. "It was clear from the beginning that this is a transient phenomenon," he said. Roth counseled patience, describing the Hubble plume hunt as a work in progress. (The current search campaign should continue through April 2015.). Phillips voiced similar sentiments, saying that weak and/or intermittent plumes could have gone undetected by Galileo. "The end result here is, stay tuned," Phillips said.